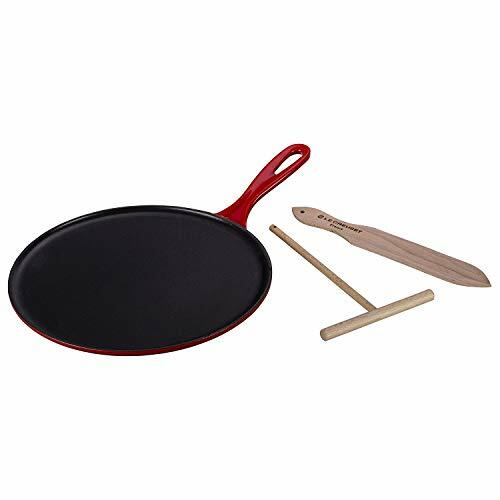 Create the best crepes as a main dish or dessert with the Le Creuset enameled cast iron 10 2/3 Inch Crepe Pan. The crepe pan has a shallow rim to make perfectly round crepes every time and the handle is angled to perform the perfect flip. Includes wooden spreader. Enameled cast iron is perfect for low heat cooking and retains heat better than any material, including stainless steel and aluminum. All Le Creuset products are enameled on the inside and out, including the black matte finish. No seasoning is required and it will not react to acidic foods.